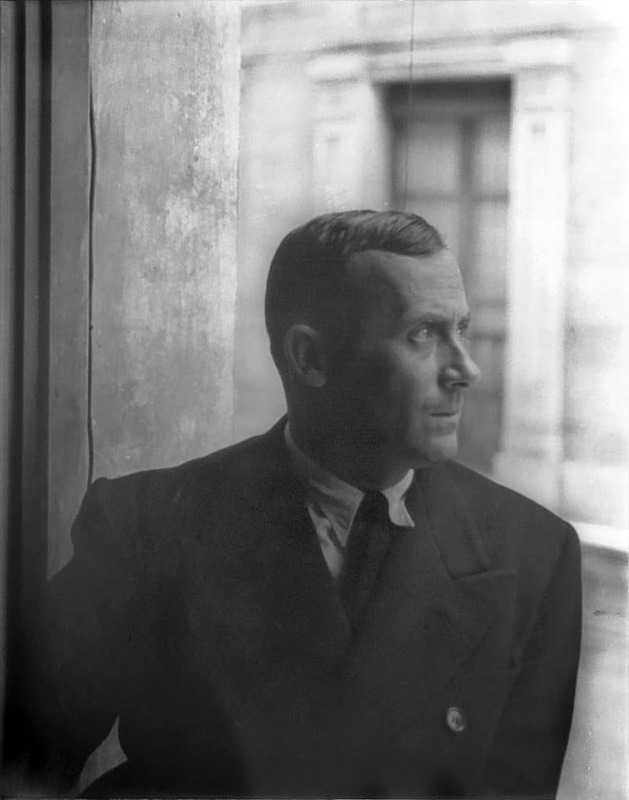 Portrait of Joan Miro, Barcelona, 1935 by Carl Van Vechten. In the Public Domain. Joan Miró was born in Barcelona, Spain in 1893. He died in 1983 at the age of 90. He was a painter, sculptor and ceramicist. He was know for his use of simple shapes, bright colours, and the symbolic meaning of his artworks. 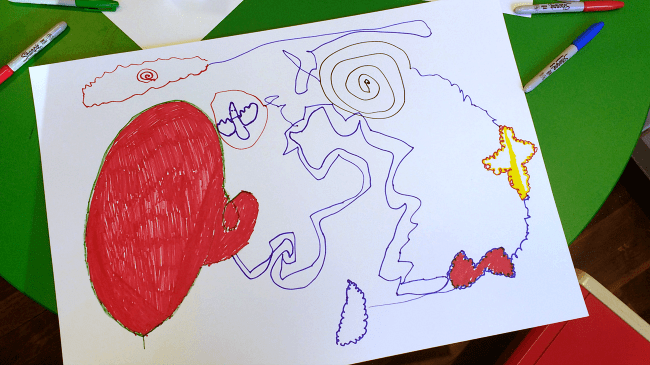 He art is often described as being child-like, dream-like, and playful. His work is classified as Surrealism. Surrealist artists, such as Miró, Dalí, and Breton, wanted to show our dreams and unconscious thoughts in art, creating unexpected and irrational images. Miró didn’t like the conventional painting methods, believing they resulted in staid, conservative, and bourgeois work. He wanted to make changes to the established ways of creating and thinking about art, and to innovate. He began making art in his childhood and continued throughout his life, using new styles, materials and ideas into his old age. He is a great Creativity Mentor. Take a look at some of his most famous paintings and answer this question: what do you see? Remember, there are no right or wrong answers, so talk freely about what you see in the paintings. Which colours does Miró use? If you were going to give each painting a title, what would you call them? Which motifs are repeated in the paintings? You will notice that there are certain motifs that are often found in Miró’s paintings. These are shapes or designs that appear across several works. Which ones stand out to you? We’re going to use some of them in our own drawings. We’ll begin by picking out six key motifs to make our own art dice. Sometimes we’re not sure how to get started on a drawing. A big, blank piece of card can look intimidating, and we can be fearful of making the first mark. What if we make a mistake? What if we run out of ideas? How should we get started? The Dice of Decision will come to your rescue! 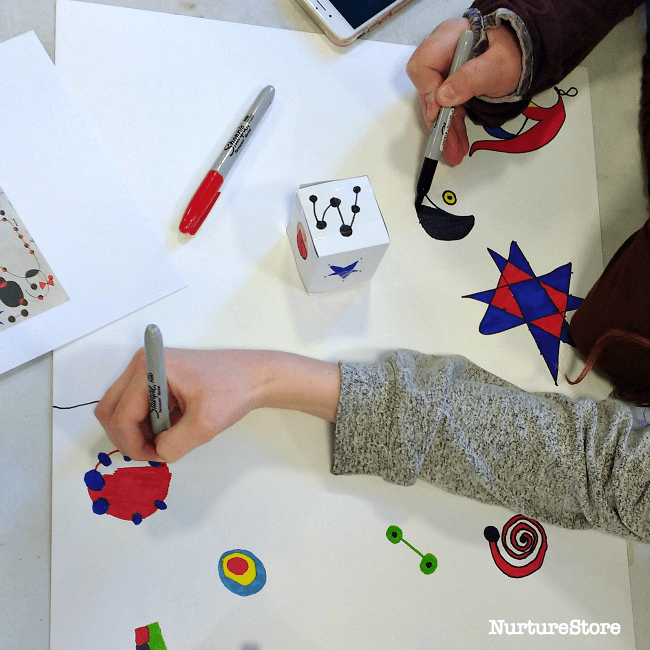 Let’s make an art dice, with one of Miró’s distinctive motifs on each face of the dice. 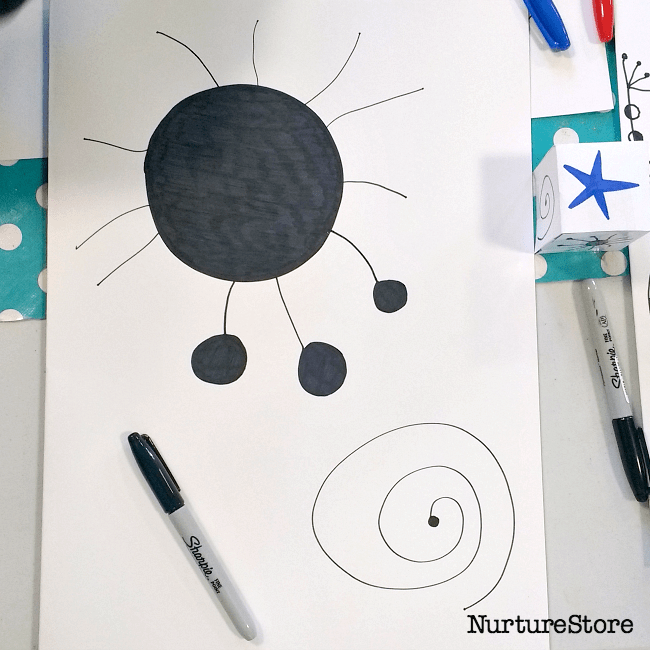 Any time we need an idea, to start or during our drawing activity, we can roll our Dice of Decision and see what it tells us to draw. It’s up to you how big to draw the motif, where to place it, and which colour to make it, but use the Dice of Decision as your friend to help you when you need a prompt. 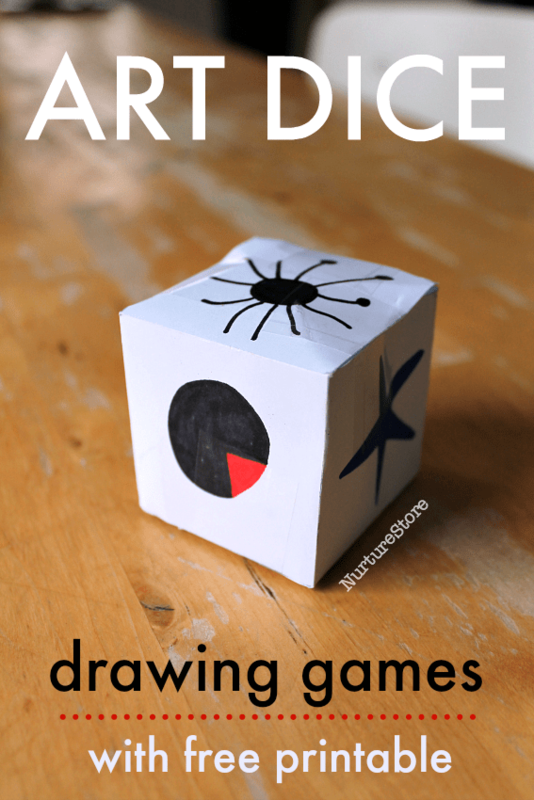 :: use marker pens to draw one of Miró’s motifs on each face of the dice. 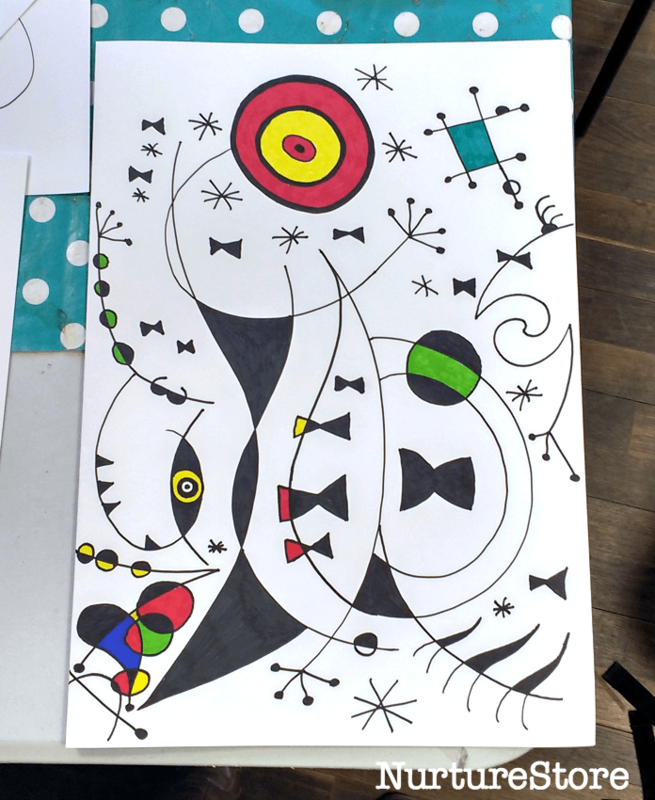 Choose the motifs that stand out to you from Miró’s work. You can use the links above to take a close look at his work. Which six will you select: spirals, circles, stars….? 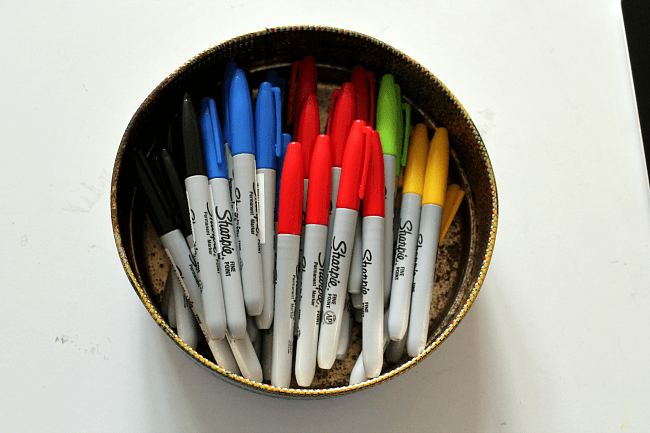 Once you have made your Dice of Decision, take a large piece of card and some marker pens. 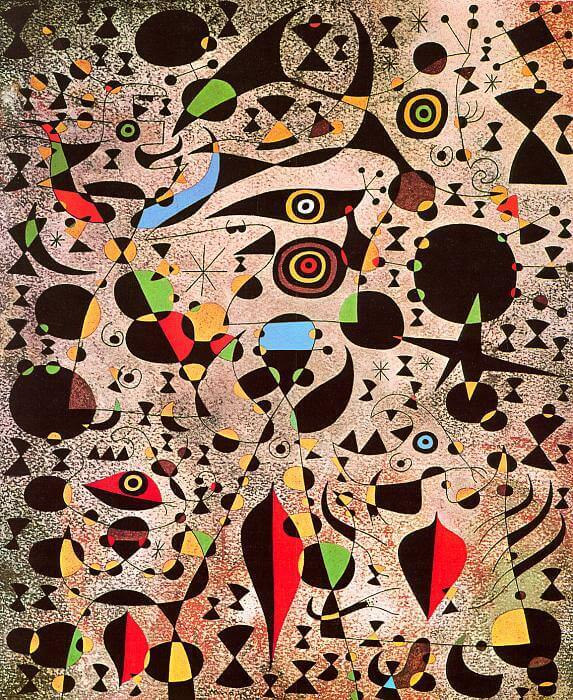 You can use Miró’s colour palette of black, red, yellow, blue, and green. 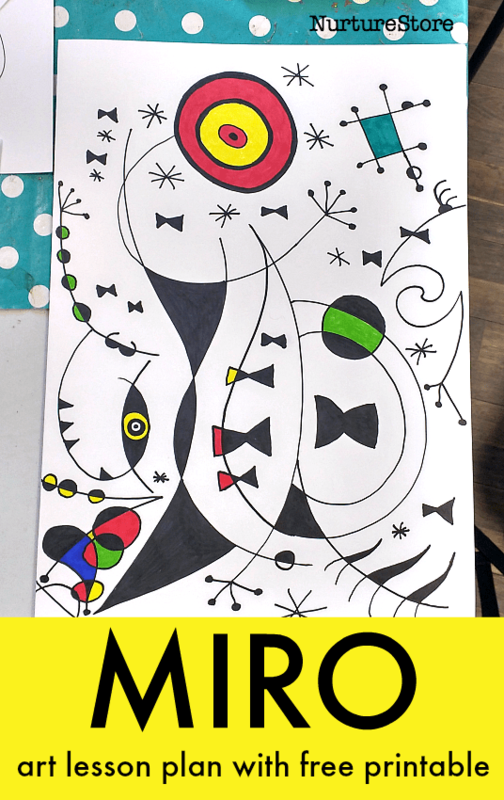 Fill your page with designs inspired by Miró. You might like to collaborate with a friend: split your card in half and draw on one side each, or work together to fill your whole page. Think about how you would like to place your motifs on your page. How big will you make each element? Perhaps you will use your symbols to create a map, or to tell a story. Remember that any time you get stuck about what to draw next: ask your Dice of Decision! When you have completed your page, share it with your siblings, friends and classmates. Ask them what they see in your drawing. 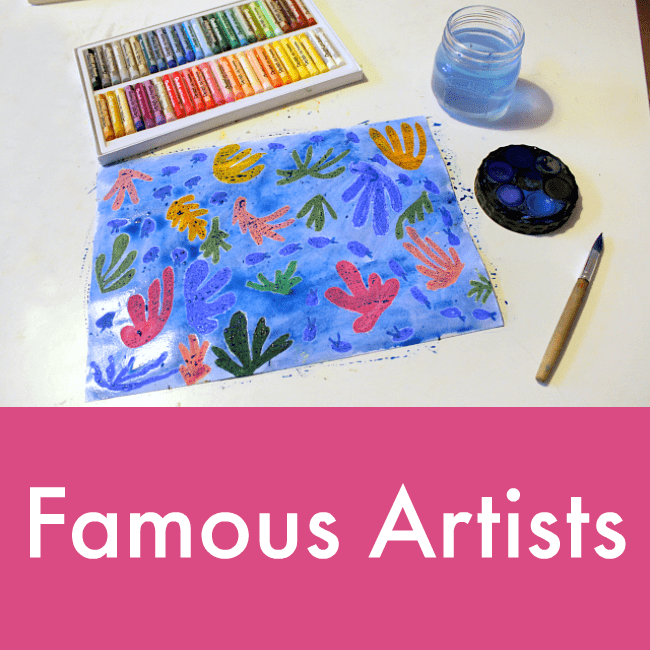 Use the free resources in our Famous Artists art projects archive to explore the work of Matisse, Giacometti, Kandinsky, Seurat, Kelly, and more, and download our complete lesson plans to explore famous artists. Thanks so much, Cathy, for the wonderful ideas in this lesson! My Year 5 Spanish class have been requesting a Spanish Art lesson, and I did not know where to start, but this has really helped! Brilliant Hazel! So happy this is a good fit for your lesson. Hope you all have fun with it. 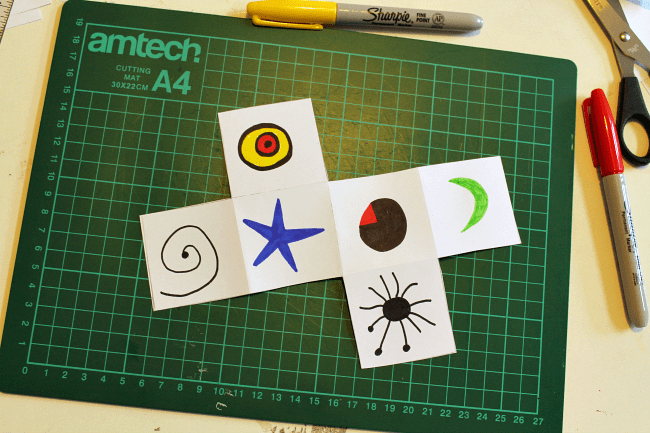 Watch out for a Picasso-inspired lesson coming soon too.